Collect This Amazing Self Improvement Bundle I Created For You! This is your personal access page after buying your Forward Steps Self Improvement Bundle. 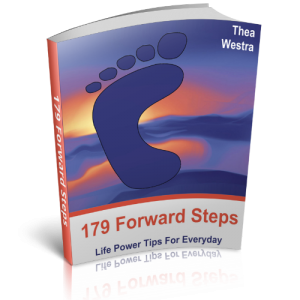 50 Life Power Questions, 130 Conscience Squirmers, 365 Forward Steps Notes, 96 Random Triggers, “Time for My Life” PDF Book, 100 Days of My Forward Steps Membership, MP3 Audio eBook Collection and the Annual Advent Calendar pages since 2008, PLUS a bonus of 100 Life Power Tips On Audio. ALL for ONE, single, packaged price! If you have bought this Forward Steps Self Improvement Bundle, then you will be able to log in below, using the details sent to you in an email with subject line “[Your Name], Thank you for your purchase of the Forward Steps Bundle“. All your information about the collection, including a link that leads you to this page for logging in, is sent in another email which has the subject line “[Your Name] Your Forward Steps Self Improvement Bundle From Thea Westra“.